The aim of this study was to evaluate the results of bouquet technique in fixation of metacarpal subcapital, neck, or shaft fractures regarding fixation stability and functional and radiological outcomes. Metacarpal subcapital, neck, or shaft fractures can be managed conservatively or operatively depending on fracture pattern and stability. A follow-up study in Boulak Eldakror Allgemein Hospital from July 2014 to February 2016 was conducted. Thirty cases of unstable metacarpal fractures were managed by antegrade intramedullary K-wires fixation and were documented and evaluated radiographically and functionally with follow-up for 6 months. Thirty cases were enrolled in this study. Fracture union was achieved in all cases at the mean of 5 weeks. At the last visit (6 months postoperatively), the total active motion score for 30 patients ranged from 170° to 260°, with mean of 222°. Normal score of 260°, with good functional and completely powerful hand, was recorded in three patients. The range of grip strength was 60–100%, with the mean of 86% compared with the healthy side. The range for Quick-DASH scores for 30 patients was from 15.9 to 0.0. Score 0 with sound union was recorded in 12 patients. Antegrade intramedullary K-wires fixation in this study showed good functional and radiographic results with fewer complications. Fractures of the metacarpal are common upper extremity injuries and comprise ~ 18% of all fractures of the hand and forearm. Displaced fractures of the metacarpal shafts and necks can be treated with a variety of techniques, ranging from conservative treatment to open reduction and internal fixation. However, operative intervention is recommended for open, irreducible, or unstable (rotational and angular) metacarpal fractures to preserve hand function. Foucher described in the French literature a technique of using multiple (three, occasionally two) fine (0.8 mm) blunt-ended Kirchner wires (K-wires) to stabilize fractures of the metacarpal neck. He subsequently reported the results of a series of 68 fractures with good results. Fracture reduction was achieved using the Jahss technique of applying a dorsal force to the distal fragment, with the metacarpophalangeal (MCP) and proximal interphalangeal (IP) joints flexed, and he then inserted the wires through a small incision at the base of the metacarpal, leaving the fracture hematoma undisturbed. The divergent tips of the wires in the metacarpal head resemble the stems of flowers and thus the term 'bouquet' osteosynthesis was coined for this technique. The wires were thought to provide enough stability to allow early mobilization and were left slightly raised from the bone to allow removal at 6–8 weeks. A variety of modifications of Foucher's technique have been published with successful outcomes. All the possible treatment options have advantages and disadvantages, and there is no one treatment that is always the best. Various techniques have subsequently been described, with some inserting the wires retrograde through a window in the metacarpal neck/head, and others inserting them orthogradely through a window in the base of the metacarpal. Some leave the tips of the wires percutaneous, others bury them in the soft tissues, and still others bury the wires completely in the medullary cavity of the metacarpal, so that they cannot irritate the surrounding soft tissues and do not need removal at a later date. In addition, some surgeons use a single large (1.6 mm) wire,, whereas others use multiple small (0.8–1 mm) intramedullary wires. After obtaining consent from the patients, 30 cases of displaced shaft, neck, and subcapital fractures of metacarpal were treated by antegrade intramedullary K-wires fixation in Boulak Eldakror Allgemein Hospital from July 2014 to February 2016. Indications and inclusion criteria include displaced unstable shaft or neck or subcapital fractures of metacarpals, dorsal angulation more than 30°, minimally comminuted displaced fractures, or rotational deformity. Patient's age was between 16 and 55 years, with the mean of 35.5 years. Twenty-six patients were males and four were females. The total number of patients was 30, where 29 patients were right handed and one was left handed. Right side was affected in 25 patients and left side was affected in five patients. Dominant hand was affected in 26 patients, and nondominant hand was affected in four patients. The mode of trauma was punching with closed fist during daily activity, participating in sports, direct trauma because of fall of heavy object on the hand, or road traffic accidents. Nineteen cases were smokers. Nine cases did office work, 13 were labourers, and eight were students. Thirty cases were classified according to site of fracture. Fixation was done in an operation room and prepared as follow: the patient was put in supine position with abducted shoulder 90 degrees and the hand on radiolucent table. The fixation was done using C-arm image and forearm tourniquet in all patients with a duration ranging from 30 to 60 min. Wrist was blocked in five patients, and general anaesthesia was used in 25 patients. A blunt 1-mm K-wire was bevelled at one end and the tip bent into a 'skid' shape 10° at 5 mm and 20° at 1 cm from the tip. Approximately 10 cm from this end, a further double right-angle bend or 'kink' was placed in the K-wire such that the bevel pointed vertically upward, perpendicular to the plane of the 'kink'. The surgeon could therefore control the direction of the bevel. Following closed manipulation and reduction of the fracture, the base of the metacarpal was located. One-cm skin incision on the dorsal aspect of the hand was made, and a 2-mm drill hole was made to facilitate wire entry. With traction on the digit, the modified K-wire was passed into the distal metacarpal fragment. The kink enabled the surgeon to push the wire along the shaft and tap it into position with a mallet while maintaining the orientation of the skid such that it remained dorsally angulated thus correcting any volar displacement of the distal fragment. After checking the reduction and wire position with the image intensifier, the K-wire was bended over and cut 1 cm beyond the skin. In all types of metacarpal fractures, the hand was put in an intrinsic plus position splint (80° MCP joint flexion and full IP joint extension) to avoid tightening of the collateral ligaments and digital stiffness for 7–10 days. If satisfactory alignment is maintained radiologically, protected active range of motion (ROM) can then be initiated. Pins were removed at four to six weeks. Satisfactory alignment and stable fixation were achieved in 22 cases. These cases started protected active ROM immediately postoperatively to avoid stiffness of MCP and IP joints. The other eight cases started only passive movement in the first week and then protected active ROM owing to associated ipsilateral metacarpal fracture or risk of secondary dislocation. Series of radiographic follow-up were done until radiographic union occurs. Pins have been removed after four weeks in seven cases, 5 weeks in eight cases, and at 6 weeks in 15 cases. In 11 cases, physiotherapy was started 6 week postoperatively, which was continued for 2 months and until obtaining a satisfactory hand function. 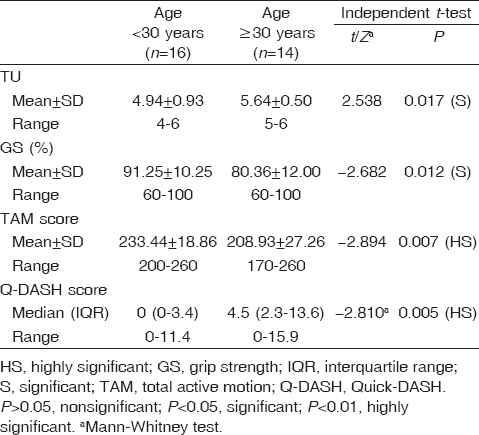 The hand function was assessed at 2 and 6 months postoperatively and after finishing the physiotherapy by measuring grip strength (GS), active range of motion (TAM score), and Quick-DASH (Q-DASH) score. The GS of both hands was measured with a Jamart dynamometer 1, 8, and 26 weeks after surgery. Fracture unionwas achieved in all cases at the mean of 5 weeks (4–6 weeks). At the last visit (6 months postoperative), residual dorsal angulation was present in five of 30 patients with the range of 5°–15°. The range of GS was 60–100%, with the mean of 86%, compared with the contralateral healthy side. The range of Q-DASH score for 30 patients was 15.9–0.0. A score of zero was recorded in 12 patients who showed sound union. A score of 2.3 was recorded in four patients who showed sound union, normal alignment, normal function, and unrestricted use of the hand, but occasional pain and discomfort without radiographic abnormality. A score of 4.5 was recorded in six patients owing to relative stiffness especially at IP joints. Pin tract infection was recorded in one of them, which was resolved after 3 weeks. A score of 9.1 was recorded in three patients; the first one has a residual angulation of 10°, in addition to decreasing the GS to 70%. The last one has a residual angulation of 15°. A score of 11.4 was recorded in one patient in spite of the sound union of the metacarpal and normal alignment. This patient experienced pain with gripping and restriction of MCP joint flexion with GS of 60%. A score of 13.6 was recorded in one patient who showed sound union, angulation 10°, GS 75%, occasional pain, and discomfort. A score of 15.9 was recorded in three patients; one of them experienced limitation of the movement of MCP joint that reduced the GS to 65% compared with the healthy hand, and the other one because of shortening of fourth and fifth metacarpal that reduced the GS to 60%. The range of TAM score for 30 patients was 170°–260° with mean of 85%. A normal score of 260° was recorded in three patients with good functional and completely powerful hand [Figure 1] and [Figure 2]. Average TAM, Q-DASH, and GS scores were better in neck and shaft fractures [Table 1]. Figure 1: A patient presented with fracture owing to fist punching that resulted in fifth metacarpal neck fracture, which was fixed by antegrade intramedullary K-wires. Figure 2: (a) Preoperatively. (b) 3 weeks postoperatively. (c) Wires removal at 22 weeks postoperatively. A good TAM score of at least 210° was recorded in 18 patients with good function, little affection of handgrip, and little restriction of joint movement especially in IP joints. A fair TAM score between 210° and 180° was recorded in eight patients with more affection of handgrip and restriction of joint movement, mostly in MCP joints. A poor TAM score of less than 180° was recorded in one patient owing to shortening of fourth and fifth metacarpal associated with highly affected hand GS (60%) and restriction of joint movement in both MCP and IP joints. Average TAM, Q-DASH, and GS scores were better in transverse fractures and in patients younger than 30 years [Table 2] and [Table 3]. None of the patients experienced a deep infection, but one (3.3%) patient required oral antibiotic for 3 weeks owing to a superficial infection. There were no pin migrations or pin bending. Of the 30 patients, five (16.6%) fractures were healed with residual dorsal angulation with the average of 5°–15°. Four of them followed physiotherapy for 8 weeks and resulted in good function outcome, and the other one was treated with corrective osteotomy and tenolysis owing to residual angulation (10°), which was associated with decrease of the GS to 70%. One case had experienced fourth and fifth metacarpal shortening but that patient had refused corrective osteotomy. In our study, with age range of 16–55 years, there were no big differences in the fracture healing between the young and old patients; however, better functional and radiological outcome were recorded in the patients with low-energy trauma (punch direct), transverse fracture of neck, good compliance, and early physiotherapy. On the contrary, patients with history of high-energy trauma or subcapital fracture needed longer time to healing and recorded finger stiffness and decrease ROM. We recorded previous scores at the last visit after finishing physiotherapy. Displaced metacarpal fractures in general can be treated with K-wire, screws, or intra-osseous wiring as well as the use of hand plates. Each choice is dependent more on the surgeon's preference and skill rather than any particular benefit with the varying approaches. Intraoperative radiography is generally required. Immobilization for greater than 2 week is suggested with K-wire fixation, and this method of fixation is generally believed to be the least invasive technique with maximum long-term function. Our study showed fracture union in all patients with neck, subcapital, or shaft fractures of metacarpal that were fixed by 'bouquet technique'. Residual dorsal angulation postoperatively was present in five of 30 patients with a range of 5°–15°. At the last visit (6 months postoperatively), the range of GS was 60–100%, with a mean of 86%, compared with the healthy side. Total range of motion was recorded, with a mean of 221°. None of the patients had a clinically detectable rotational deformity. As the K-wires do not cross either the counter-movement jump or metatarsophalangeal joint, so stiffness of these joints was of small degrees, mostly owing to bad compliance of some patients in postoperative physiotherapy. Patient satisfaction achieved in 25 of 30 patients. Foucher had reported excellent results with the use of 'bouquet' osteosynthesis in the management of displaced small finger metacarpal neck fractures. Using a similar antegrade intramedullary K-wire fixation technique, Kelsch and Ulric reported satisfactory 1-year radiographic and functional results in 35 patients. The fractures were immobilized for 2–6 weeks, depending on patient compliance. Hopfner and colleagues found significantly decreased motion of the metatarsophalangeal joint in the retrograde cohort. There was decreased shortening of the metacarpal after antegrade fixation, suggesting that intramedullary fixation was preferable, when comparing antegrade intramedullary pinning with transverse K-wire fixation. Winter and associates studied two statistically comparable groups of patients with boxer's fracture treated by transverse K-wires or antegrade intramedullary K-wires and suggested that intramedullary pinning is a particularly efficient procedure for treatment of the Boxer's fracture. Although more demanding, it has shown better results than transverse pinning. The difference between the two techniques in terms of early motion is probably explained by the independent mobility of the two metacarpal bones. Two weeks after removal of the wires, they noted that the difference of total active ROM and total passive ROM between the two groups decreases. However, at 3 months, the functional results remained slightly better in the intramedullary pinning group. Antegrade intramedullary K-wires fixation in this study showed good functional and radiographic results with fewer complications. With the elastic prebent wire acting as a three-point fixation, adequate stability is achieved to commence early mobilization. In addition, this procedure is relatively simple, with reduced operating times, minimal radiation exposure, minimal iatrogenic soft tissue trauma, and can be performed as a day-case procedure. Chung KC, Spilson SV. The frequency and epidemiology of hand and forearm fractures in the United States. J Hand Surg Am 2001; 26:908–915. McNemar TB, Howell JW, Chang E. Management of metacarpal fractures. J Hand Ther 2003; 16:143–151. Foucher G. 'Bouquet' osteosynthesis in metacarpal neck fractures: a series of 66 patients. J Hand Surg Am 1995; 20(Pt 2):S86–S90. Jahss S. Fractures of the metacarpals a new method of reduction and immobilization. J Bone Joint Surg Am 1938; 20:178–186. Smith NC, Moncrieff NJ, Hartnell N, Ashwell J. Pseudorotation of the little finger metacarpal. J Hand Surg 2003; 28:395–398. Meals RA, Meuli HC. Carpenter's nails, phonograph needles, piano wires, and safety pins: the history of operative fixation of metacarpal and phalangeal fractures. J Hand Surg Am 1985; 10:144–150. Calder JD, O'Leary S, Evans SC. Antegrade intramedullary fixation of displaced fifth metacarpal fractures. Injury 2000; 31:47–50. Mockford BJ, Thompson NS, Nolan PC, Calderwood JW. 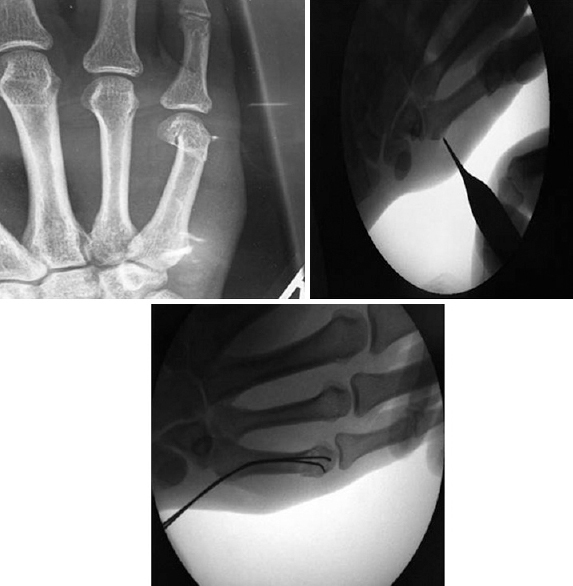 Antegrade intramedullary fixation of displaced metacarpal fractures: a new technique. Plast Reconstr Surg 2003; 111:351–354. Faraj AA, Davis TR. Percutaneous intramedullary fixation of metacarpal shaft fractures. J Hand Surg 1999; 24:76–79. Yan YM, Zhang WP, Liao Y, Weng ZF, Ren WJ, Lin J, et al. Analysis and prevention of the complications after treatment of metacarpal and phalangeal fractures with internal fixation. ZhongguoGu Shang 2011; 24:199–201. Kelsch G, Ulrich C. Intramedullary k-wire fixation of metacarpal fractures. Arch Orthop Trauma Surg 2004; 124:523–526. Liew KH, Chan BK, Low CO. Metacarpal and proximal phalangeal fractures–fixation with multiple intramedullary Kirschner wires. Hand Surg 2000; 5:125–130. Lane CS. 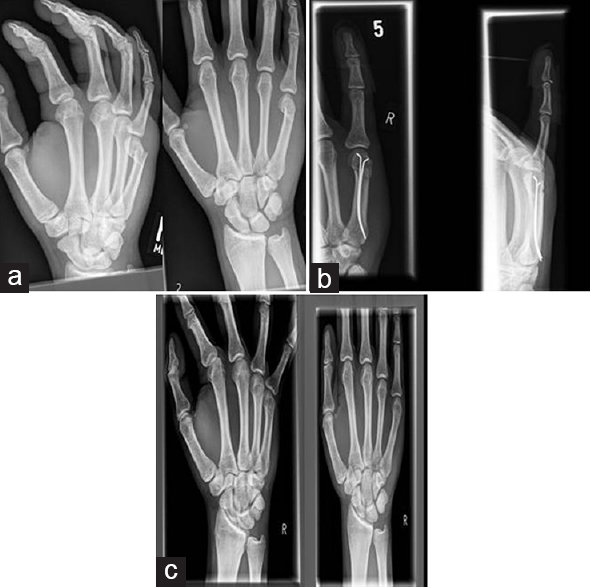 Detecting occult fractures of the metacarpal head: the Brewerton view. J Hand Surg 1977; 2:131–133. Fusetti C, Meyer H, Borisch N, Stern R, Santa DD, Papaloïzos M, et al. Complications of plate fixation in metacarpal fractures. J Trauma 2002; 52:535–539. Galanakis I, Aligizakis A, Katonis P, Papadokostakis G, Stergiopoulos K, Hadjipavlou A, et al. Treatment of closed unstable metacarpal fractures using percutaneous transverse fixation with Kirschner wires. J Trauma 2003; 55:509–513.